Page 3: Pearl Harbour - Peter Shilton's Handball Maradona! See also: Chaos Rising, Concave, Ice Slider, Jewel Warehouse, Potato Rescue. The Grand Vizier has captured the Sultan's daughter and has given her an ultimatum; either marry him, or die! 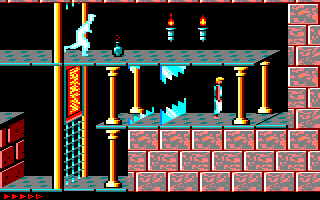 You have one hour in which to get out of the dungeons and rescue her from her cell before the Grand Vizier kills her. Each level sees you fighting guardians and finding the way out, and there are potions to be drunk, too. This was also one of the first games to feature real animation, where the characters really do move properly, and the number of actions you can perform are astonishing. The graphics are incredible, especially the intro sequence, and really, the only bad thing about this game is the awful 'music', which thankfully isn't present in the main game. Watch YouTube videos of this game by: Axelino, jgonza, Metr81, Xyphoe. The inmates are running riot in a high security prison, and you have been sent in to find their leaders and restore order. 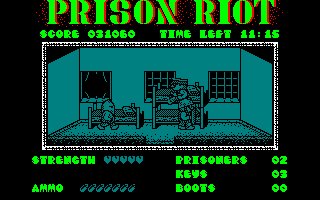 You must explore the prison (which is very large), collecting food, ammunition, and keys to enter the cells. Some of the cells will have their windows broken, where a leader will be waiting on the rooftop for you to negotiate his surrender – but you'll have to solve a puzzle (one of those sliding tile games) within 60 seconds. This game looks and plays very similarly to the Joe Blade series, but like those games, it's got dull, monochrome graphics, a mediocre tune, and poor gameplay. Within the Chamber of Midas lies an ancient secret – but what exactly is it? In order to find out, you must fly through several mazes. Each maze contains four code pods which you must collect in the correct order. When you've got all four, you must then fly to the base to take you to the next maze. Of course, there are aliens in each room which you must shoot – but your supply of laser bolts is limited, although it can be replenished. 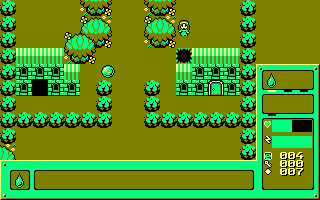 This is a monotonous exploration game with very poor graphics and sound. There's just not enough excitement in the game to make you want to collect the code pods. It's time to get on your bike again, as you race against three other BMX bikers to complete three laps of each course before your time runs out. Believe it or not, up to four players can play against each other. There are three sets of tracks – dirt biking, desert riding and quarry racing – and there's also a choice of playing in either standard or expert mode (where you have to choose chain and wheel sizes for your bike). It's tough enough even in standard mode – the first two courses are quite easy, but after that, the time limit becomes far too tight to beat. See also: BMX Simulator, BMX Simulator 2. The Machine Sorcerer Wardlock has created an organic lifeform in his Mechlab laboratories – but Solo the Syntheman doesn't want to be experimented on for the rest of his life (and who can blame him? ), and he wants to escape from the Mechlabs with baby Nejo, who will need to be fed with milk and have his nappy cleaned occasionally, like all babies. The Mechlabs are divided into four zones and are also filled with Wardlock's previous experimental creations. Contact with these sends Solo all the way back to the start of the maze. This is no fun whatsoever, and to make matters worse, none of the monsters can be killed. The isometric graphics are reasonable, but I suggest you turn the volume down; the music (if you can call it that) is probably the worst you will ever hear on the CPC! You're a treasure hunter, exploring the Egyptian pyramids with no regard for the sanctity of the place (the name of the game means 'desecration' in English) and grabbing whatever treasures you can find. Naturally, there are lots of monsters which will kill you if you touch them; mummies, beetles, blobs of slime, and bats which home in on you very quickly. Fortunately, you are armed with a gun to shoot the monsters, but after you've shot a monster, another one will appear. 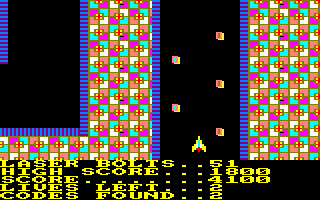 In essence, it's a Gauntlet clone with some very detailed graphics, but it's too easy and you'll soon get a sense of déjà vu when the levels soon start to repeat themselves. Johnny Jones has found himself falling down a long shaft into the temple of Abu Simbel, from which he must escape. 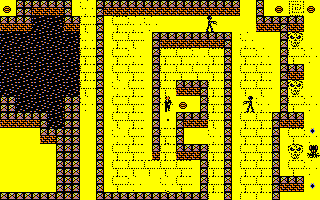 This platform game is the sequel to Dinamic's Abu Simbel Profanation, which has a reputation for being very difficult, requiring pixel-perfect jumps and exact timing. Profanation 2: Escape from Abu Simbel takes this to even more ridiculous extremes, to the point of making it practically unplayable for all but the most expert of players. Even with nine lives, I have only managed to see the first four screens without resorting to cheating! The game finished in second place in the 2017 #CPCRetroDev Game Creation Contest, but while the graphics and music are of a very high standard, the sheer difficulty of the gameplay mars it terribly. See also: Abu Simbel Profanation. I've never gone skiing in my life, but this simulation lets you compete against the computer or another player on several pistes. The screen scrolls down slowly and if you don't keep up, then you'll lose sight of where you are and it will be almost impossible to recover. You also have to complete each piste within a time limit. This may seem easy but it most certainly isn't. The controls are rather awkward and it's often difficult to get your skier moving, and seeing the computer sweep through each set of flags with ease doesn't exactly raise your morale. I like the beautifully detailed scenery and the music, though. Play a round of golf on an 18-hole course, ranging from easy 3-par holes to much trickier 5-par holes surrounded by water and sand bunkers. You can practice any of the holes, and you can also perfect your putting skills. Taking shots is easy enough; select a suitable club and the direction to hit the ball, and judge the strength of your shot and whether you want the ball to veer to the left (hook) or right (slice), taking into account the wind direction. The course is viewed from a top-down perspective, which is annoying when your ball lands underneath a bush or a tree. The graphics are good, as is the music (yes, music in a golf game! ), and while it's not the most realistic golf simulation for the CPC, it's still pretty good. It even comes with an editor to let you design your own courses.